FONTANA, Calif. -- Police arrested a man for animal cruelty after he allegedly placed a kitten in a freezer and threw the feline off a second-story balcony in Fontana, Calif..
Fontana police received a report around 2:45 a.m. Tuesday about a man, identified as 34-year-old Lucio Lopez, assaulting a kitten that was just 3 to 4 months old. By the time officers arrived on scene, Lopez had fled the apartment. Officers canvassed the area and found Lopez driving in the area of Oleander and San Bernardino avenues. A cat is seen with a bandage on its leg after authorities said Lopez threw the animal off a balcony in Fontana. Upon investigation, officers learned that Lopez was upset that the kitten entered the apartment. Witnesses said Lopez placed the kitten in the freezer. 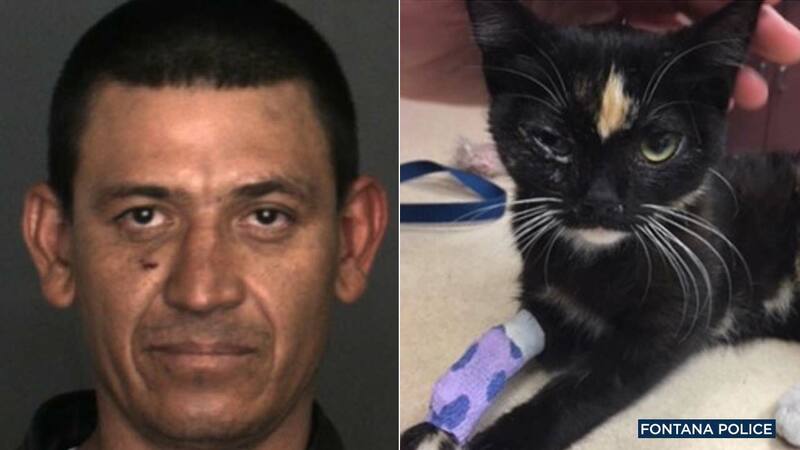 After an unknown amount of time, Lopez took the kitten out of the freezer and began squeezing its body as the frightened cat cried out in pain, police said. Investigators said that's when Lopez threw the kitten out of a second-story balcony. The kitten struck the concrete floor and suffered major injuries to its chest and a fractured leg. Lopez was arrested and booked at the West Valley Detention Center for animal cruelty and an outstanding warrant. Fontana Animal Services responded to the scene and transported the injured kitten to the veterinarian for emergency treatment. "The kitten is doing as well as could be, but will need surgery and much needed love," Fontana police said in a news release. Authorities believe the female kitten is a tortie. Emergency room staffers have nicknamed her "Olive."